Use the following steps to test if the Liquid changes for Discount Ninja were set up in a copy of your live environment. Cart page: if you accepted the promotion then you should see the discounted price on the cart page (subtotal) as well as the total discount (below subtotal). Finally, if you have set up a product level discount code, the discounted price should also be shown on the affected cart line item(s). If you are not entirely happy with the result, do not hesitate to contact us. If everything is looking good, please let us know and go ahead and publish the theme. If you are happy with the results, you can put them live, by publishing the theme. 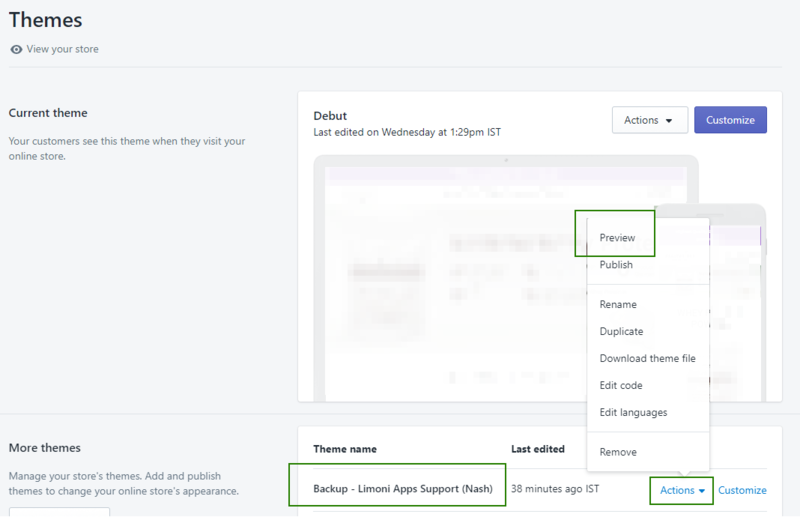 Simply repeat the steps mentioned above in the section "Preview the theme". But instead of "Preview", click "Publish". If you are happy with the result and require no further support, please go ahead and revoke the Collaborator access.